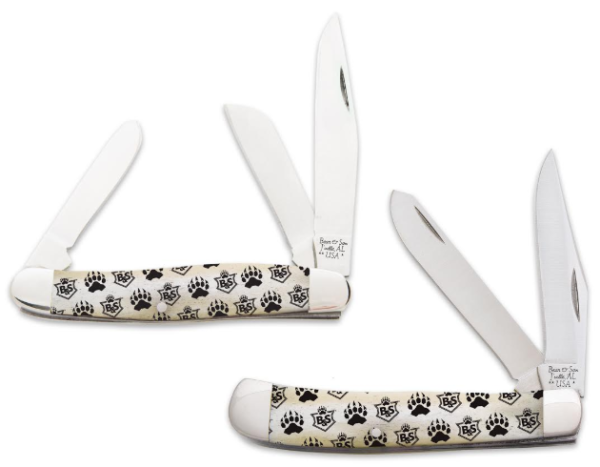 Jacksonville, Alabama - Bear & Son Cutlery, manufacturer of premium made-in-the-USA knives, adds a new series of pocket knives to the 2019 lineup with Bear Branded Bone knives. Celebrating almost 30 years of knife manufacturing and the launch of Bear & Son Cutlery’s new logo, the Bear Branded Bone Series celebrates these with a laser engraved white smooth bone handle series. Complemented with high carbon stainless steel hollow ground blades and nickel silver bolsters, these pocket knives are built with over 90 hand operations proudly manufactured in the Bear & Son Cutlery factory. The Bear Branded Bone series consist of three Lockbacks, two Trappers, one Large Stockman, and a Cowhand design. The new White Smooth Bone Lockbacks include a 3” Clip Point (WBJB26) and 3 ½” Midsize Drop Point (WBJB61). Offered in one size up, the 3 ¾” Clip Point (WBJB05) is perfect for larger hands. These new pocket knives are comfortable to carry in front or back pockets, are lightweight and come standard with a lifetime warranty. For those looking for additional cutting options, consider the new 4 1/8” Trapper (WBJB54), 3 ½” Mini Trapper (WBJB07) or the new 3 7/8” Large Stockman (WBJB47). In the field or around the house, these knives are dependable, tough and backed by Bear & Son Cutlery’s lifetime warranty. The 3 ¾” Cowhand (WBJB149L) is a popular knife for its durability, smooth one-hand opening and positive locking action. The 2 7/8” high carbon stainless steel blade cuts through cordage, boxes, and other materials with ease. Weighing 2.7 ounces the Cowhand is comfortable to carry every day, includes a robust metal pocket clip and a lifetime warranty. To learn more about Bear & Son Cutlery’s 2019 pocket knives, download the online product guide, visit www.bearandsoncutlery.com or call 1-800-844-3034.